A family are blaming Network Rail for the violent death of their horse and pony - that had to be put down after being hit by a train. Samantha Ashby, 11, was heartbroken when her pony Tinkerbell and horse Tony escaped her family’s field and were struck - leaving them with horrific injuries. The family keep their horses and ponies in a field above a railway line and dad-of-three Darryl said that he had been allowing Network Rail contractors to access the line through a bordering fence for maintenance work over the past few months. He said he had asked the workmen to ensure they closed over the electric fencing each time they passed through so the animals could not escape. However, on Monday morning, the fencing was knocked down - something that Darryl says could not have happened had it been closed properly. Samatha was devastated when three-year-old Tinkerbell was found desperately injured in the field - having nearly bled to death due to a cut artery before being put down. The train’s impact was so strong that the escaped white and black animal, who was bought as a companion for her main horse Tony, was thrown 40 feet from the train track back into the field. But things went from bad to worse as Samantha and her dad Darryl realised that 10-year-old Tony was also missing. The pair searched for the grey horse, who Samantha rode every day, for the next five-and-a-half hours before finding him standing on the bank of a river that runs beside the line with a “horrendous” and gaping wound. Around 20 firemen attended to remove the horse before a vet declared it had a broken leg too, as well as a shattered hip and pelvis, and had to be put down. The barrier damaged after the train strike. Darryl, 48, said: “I didn’t let Sammy see Tinkers because it was too horrific. “But when we found Tony, she cuddled him and he gave her a kiss as usual because he was really alert, which was strange considering how many hours he’d been standing there. As well as Tinkerbell, who had been saved from a meat factory, and Tony, Samantha, who has been learning to horse ride for over five years, also has a 15-year-old white and brown horse named Tipex and two brown Shetland ponies named Minnie, four, and Mouse, one. 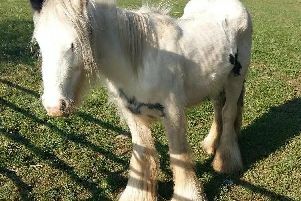 Darryl, who lives above the Wakefield-Barnsley line, said: “The horse was missing from 6.30am-2pm. “National Rail told me that someone would check the track, but no one including workers are allowed on the red section of the line unless it’s closed. “When I rang and told them, they were not prepared to close the line, even though the horse could have been lying in the red section. They just said they would caution drivers to drive slower through that area. Darryl, who is married to Janet, 51, and has two older sons, Andrew, 21, and Michael, 18, explained how the news about Samantha’s two animals has come at a particularly bad time for the family. Darryl, who owns a garage that specialises in classic Mini restoration, said: “Last week I had to break it to her that I wasn’t very well. I thought I might have cancer. “This week, we also got told that her grandma has cancer. For an 11-year-old, she has had one hell of a week. “I didn’t have time to get my results the day the horses died so I got them the next day. Luckily I’m all clear, but the doctors think it could be something else, like Crohn’s disease. “After Sammy was born, I stayed off work as a house husband so the bond between my daughter and I is unbelievable. A Network Rail spokesperson said: “We work tirelessly to maintain the fences and boundaries on the 20,000 miles of track on our rail network but on rare occasions animals which are kept in nearby fields can break through fences and escape onto the tracks. “At our last inspection (July 2016) the fence in question was intact and we received no information that the fence had become damaged prior to the reports from a train driver on Monday morning that he believed he had struck an animal. We understand this is a distressing incident and our sympathies go to all those affected by it.